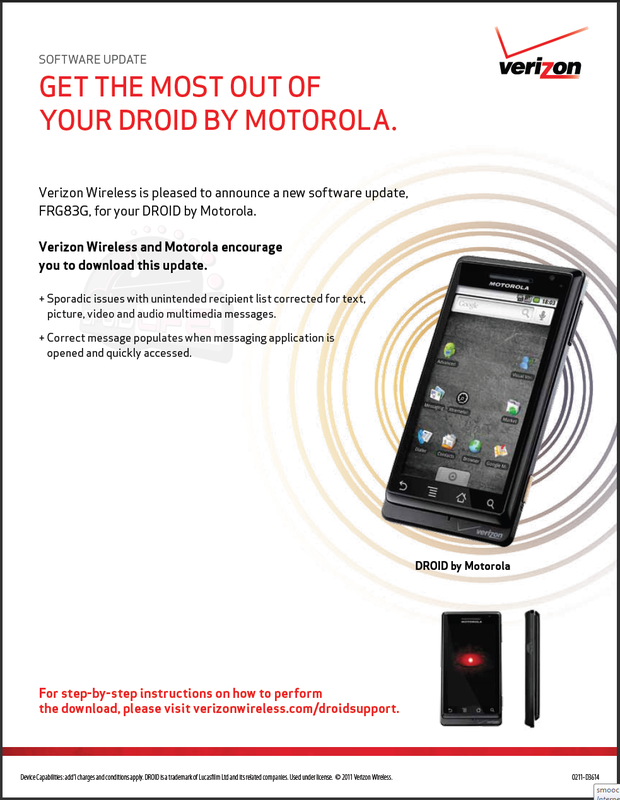 Motorola Droid Android 2.2.2 Update Rolling Out Today! It was in late January that we reported about the original Motorola Droid Android 2.2.2 update is under testing from Motorola. Today, Droid-Life is reporting that Motorola and Verizon are done with all their tests, and will be releasing the OTA update to Droid owners today itself. The FRG83G OTA update will update the Droid Android OS version to 2.2.2. The Android 2.2.2 was released by Google so as to fix the famous ‘SMS’ bug. * Sporadic issues with unintended recipient list corrected for text, audio, picture, video and audio multimedia messages. * Correct message populates when messaging application is quickly opened and accessed. It is more or less certain that the Droid won’t get the Android 2.3 Gingerbread update. However, it is nice to see Motorola still releasing minor Android OS update a handset which is more than a year old now. The Droid is the first handset in the market to get the Android 2.2.2 update, excluding the Nexus One. Other manufactures should learn from Motorola and release the Android 2.2.2 update for all their Android handsets. The FRG83G update for the Droid weighs in at 3.4MB, and will be pushed to all Droid handsets beginning from today. I got my update to 2.2.2 pushed to my phone this morning, installed flawlessly. I saw 2.2.2 on verizon today. I can’t believe Verizon pushed the update through Wifi, considering all their apps are locked down to their network. If I rooted the device, then could I install 2.3? This update caused my screen to become unresponsive and possessed. pulling out the battery fixed the problem for a couple minutes. grrrreat way to start the day! I just updated today. It installed without a problem, and it seems some messaging issues have been fixed. I lost my clock on my docking station with the new update? It works for about 2 minutes and then shuts off to a total black screen. I have the Motorola Droid with the sliding keyboard… Does anyone have the same problem? And if so, do you know how to make it work again? I use this as my alarm clock! My 2.2.2 to Droid installed easily… however it seems to have broken a number of things and in checking forum posts, it isn’t just me. The ‘home’ button no longer works after the upgrade. It vibrates, but has no function. The start screen (unlock from left, volume from right) disappeared. My ringer was set to none. The worst change, all incoming calls now go straight to voicemail and I have found no way to change this. NOT happy with this release. Worst update EVER! It deleted my contacts, made my apps hidden, and got rid of easy wifi access.